Stop wondering what to do with salmon fillet every time you buy one. 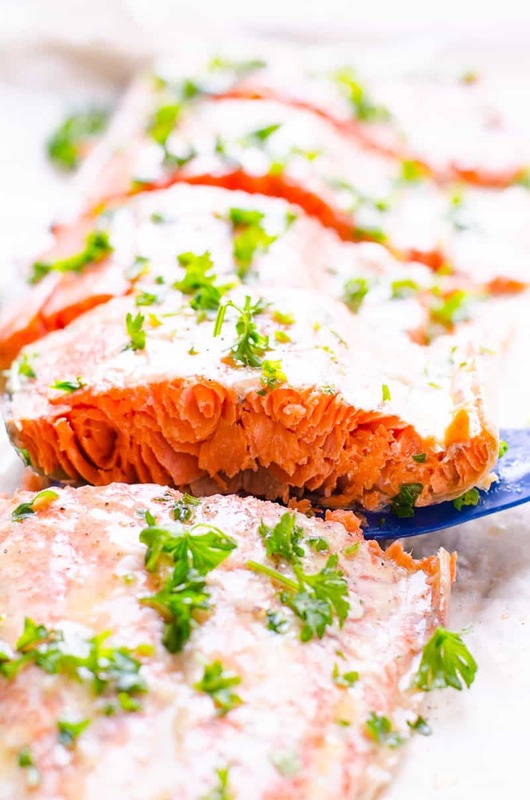 Today I will share my easy baked salmon with simple seasoning in just 20 minutes. 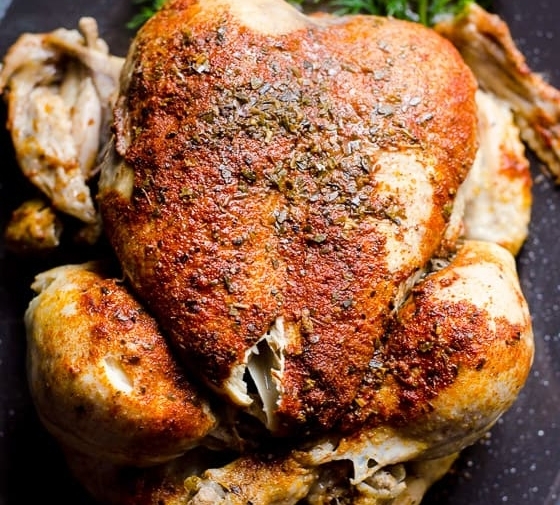 It’s juicy, flaky and quick. Simply the best! 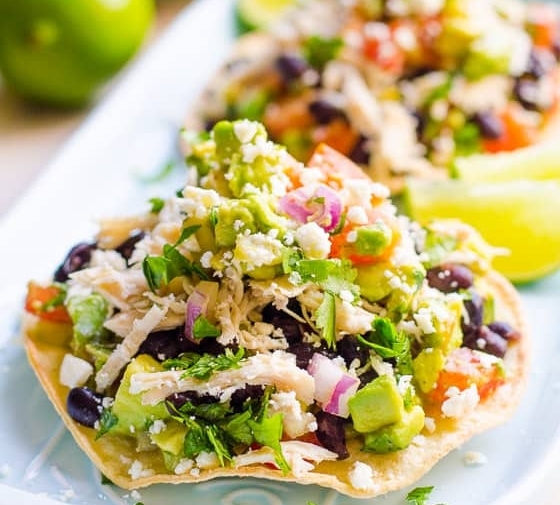 Your mother-in-law will be begging for the recipe. Ha! Farm raised salmon is much higher in contaminants found in the water they swim in and food they eat. Its diet consists of a processed high-fat feed in order to produce larger fish. 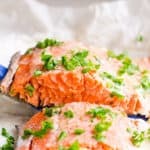 Farmed salmon contains 46% more calories (mostly from fat), slightly more Omega-3s, much more Omega-6 fatty acids and 3 times the amount of saturated fat than wild salmon. It does tend to come out more juicy because of all the fat. Wild caught salmon eats natural food in the ocean and contains more minerals. It has 3 times less Omega-6 fatty acids which are known to cause inflammation, our Western diet culprit. Obviously, wild salmon like sockeye, coho and spring is more healthy choice than farmed. I know it’s pricey therefore salmon is a treat for us. Also wild salmon is more dry meat, so we better cook it right. Tip: Even if you’re not a fan of salmon skin, I highly recommend purchasing a salmon fillet with skin on. It prevents salmon from drying out while cooking. You can always remove it easily after cooking. I’m from Ukraine and I believe in power of garlic. And moderate amount of butter. I like to season simple baked salmon after. 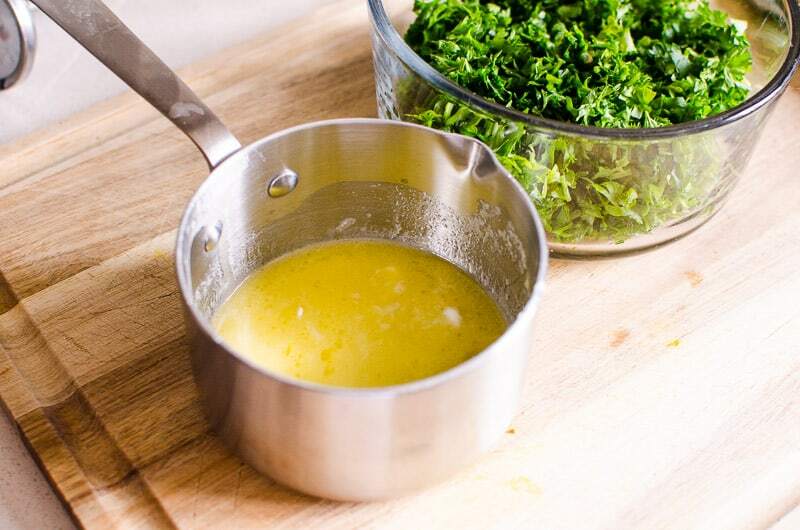 That way you get the most “juice” from small amount of butter and fresh herbs are just the best. I am not a fan of baked sadly looking pale green herbs. They lose all their flavor. So, melted butter, freshly grated garlic, a squeeze of lemon juice and fresh parsley or dill. 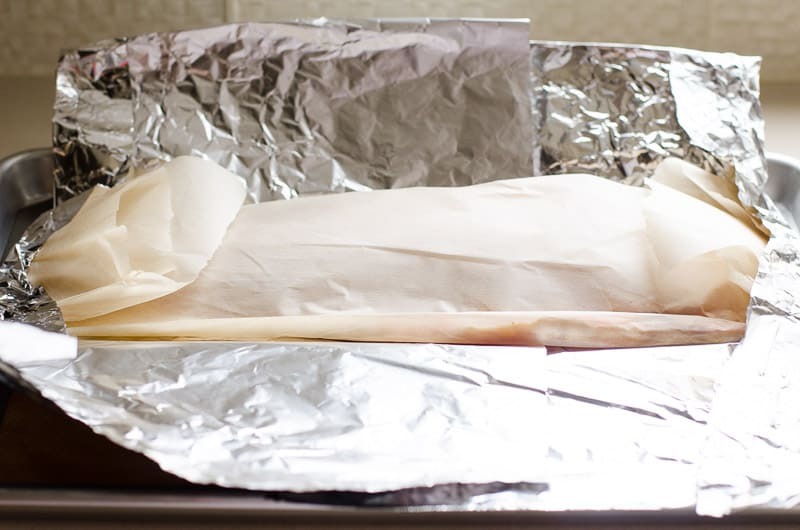 Why Bake Salmon Wrapped in Foil? 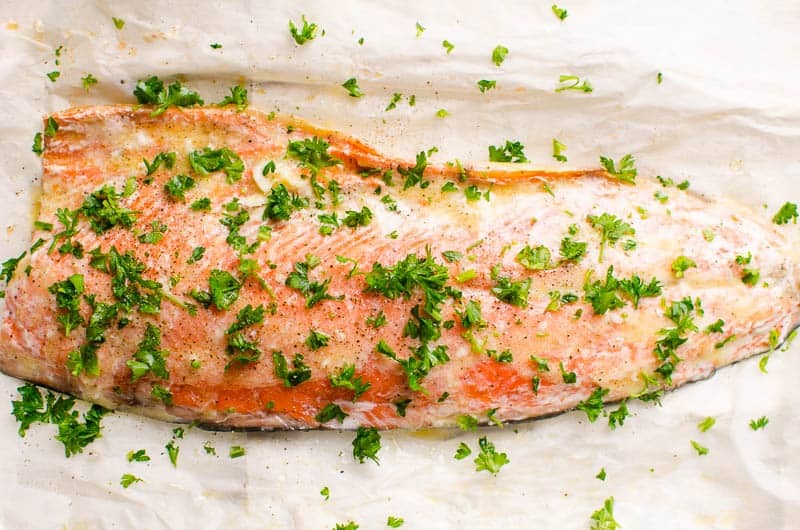 Foil wrapped salmon retains its moisture and cooks faster. In fact, I think it’s one of the best ways to cook salmon in the oven. If you notice, I also wrap salmon in parchment paper before I wrap it in foil. This small extra step prevents harmful chemicals from the foil leaching into our healthy salmon. You can skip the parchment paper if you wish, however it takes a minute and makes my sleep at night better. 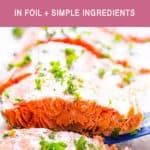 How Long to Bake Salmon in Foil at 375? For 20 minutes at 375 degrees F. That’s it. Thanks, foil! 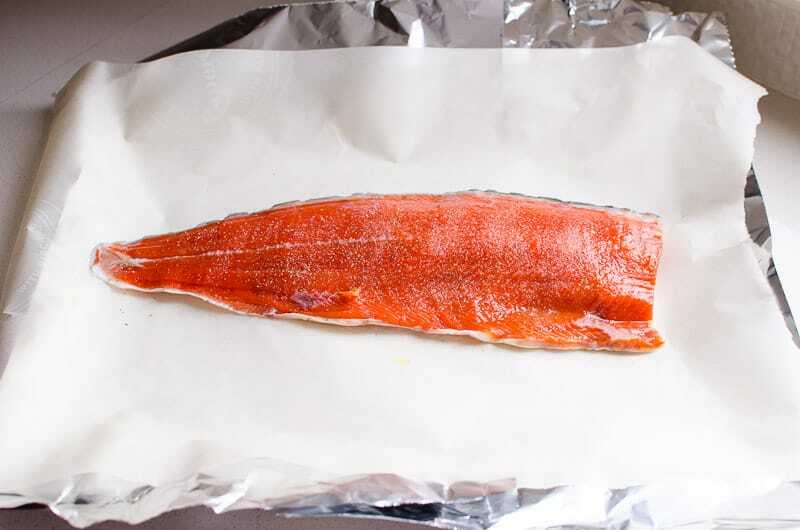 One big rule of baking salmon in foil is not to overcook it, especially wild salmon. 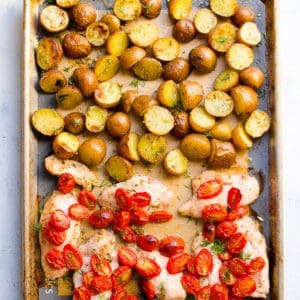 You want to remove salmon from the oven after 20 minutes. 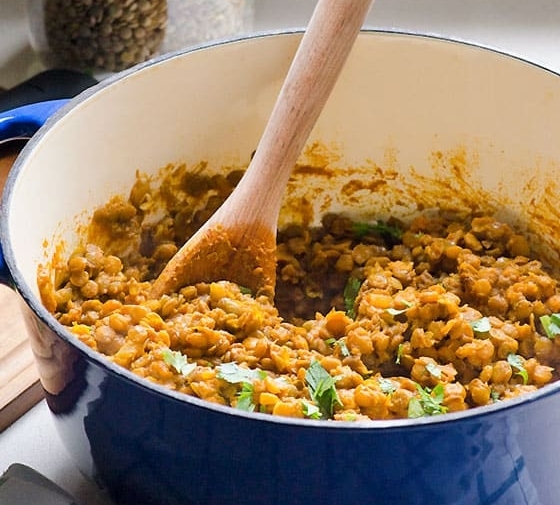 Open up and check with a fork for doneness in the thickest part. If it’s not quite done, cover with foil and let rest for 5-10 minutes or pop it under the broiler. Broiling salmon will also give it a nice char. What to Serve with Salmon? Ah, the best part. Eating. 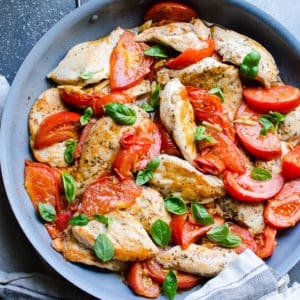 :) Salmon fillet is the most versatile entree. Again, because I’m Ukrainian married to Russian we love healthy mashed potatoes as an accompaniment to any meat or fish. If you want a lighter fair, serve easy baked salmon with cauliflower mashed potatoes, broiled asparagus or cauliflower risotto. Super low carb. 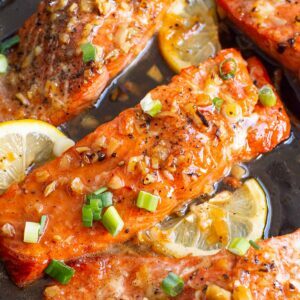 Honey garlic salmon – pan fried until crispy. Lime ginger salmon – Asian twist on salmon. Salmon burgers with mango slaw – no bread or breadcrumbs and so easy!!! Cedar plank salmon – with Thai sauce and smoky flavour (OMG! ).